Update on 8/10/14 - I've been making this recipe for the last four years and my family still loves it! I haven't changed a thing and it's so easy! This is my third time making Bistro Chicken. The first time it was great and my family gobbled it up. I blogged about it here. Then the second time I added more tomatoes and it wasn't so good. However, I made it again and it was delicious. My kids ate it without compaint (they usually don't like chicken). I changed the recipe a little bit from how I made it before, so I'm posting my version of the recipe. 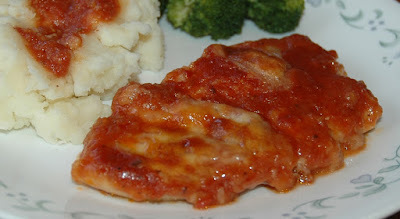 Dredge thin chicken breasts in flour. Salt and pepper chicken. Brown chicken in olive oil. Remove chicken from pan and wipe remove excess oil (if any) and place in a single layer in a casserole dish. Add french onion soup and diced tomatoes to pan. (I pureed the soup and diced tomatoes, since my family doesn't care for onion and tomato pieces). Simmer 5 minutes reducing the sauce. Pour sauce over chicken in casserole dish. Top chicken with slices of cheese. Bake for 20 minutes at 350.